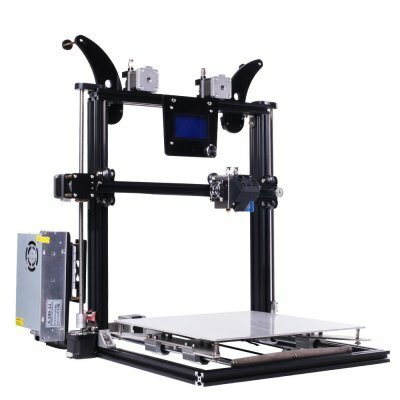 Successfully Added Zonestar Z8XM2 DIY 3D Printer – Large Printing Volume, Multi Color Printer, Dual Extruder, DIY, SD Card Printing, LCD Display to your Shopping Cart. This remarkable DIY 3D printer set from Zonestar is perfect for small businesses, hobbyists, and 3D printing enthusiasts who are looking for a printer that supports a large printing volume. This beauty supports a whopping 300x300x400mm printing volume which makes it great for designing larger sized objects. Thanks to its dual extruders, it allows you to print multiple colors at once. In order to make sure this 3D printer is right for your project, it comes with an adjustable nozzle size. Thanks to this, you can easily choose between rough and detailed printing jobs. With its wide filament range, this 3D printer meets the demands of any type of art project. It come with a stable metal frame and supports highly accurate printing for a smooth and flawless end result. Thanks to its LCD display, this gizmo is extremely easy to use and operate. It is compatible with Windows, iOS, and Mac systems. For offline usage, it supports SD card printing. No matter what you have in mind, with this 3D printer you’ll be able to create it in the blink of an eye. This 3D printer comes with a 12 months warranty, brought to you by the leader in electronic devices as well as wholesale electronic gadgets..